Found a dog or cat in a hot car? You've come to the right place! Follow the steps below to help save a life. Following all these steps will help you provide the best assistance (in the right order), provide proof if the pet/car owner is charged, as well as help protect you and especially the pet. Thanks for helping and taking action! Note the time – The “stopwatch” function on your smartphone or watch is great for this! Or take a screenshot of your phone with the time so it's documented when you first saw the animal. Of course writing it down is an option too, but doesn't provide absolute proof if required by law enforcement. Document the location & vehicle – Take note of the make / model / color / license of the car, as well as a description of the pet(s). Have proof of where the car is (e.g. in the shade, in front of a store). Photos and short videos taken on your phone work GREAT for quickly documenting and sharing these details! ⁃ Are they panting, pacing, pawing at the window, hiding in the “shade” under the dash, appearing dazed/confused/uncoordinated, or unresponsive? Have they vomited or had diarrhea in the vehicle? Do you notice any bleeding, such as from their nose? Or do they currently appear comfortable and content? The steps you need to take, and the order and urgency in which you take them will depend on the pet’s condition. See Steps 2A, 2B & 2C. - Certain pets are at increased risk of suffering from the effects of heat faster than others. These include “flat-faced” (brachycephalic) pets (e.g. Bulldogs, Pekingese, Boston Terriers, Persian cats, etc. ), elderly pets, very young pets, overweight/obese pets, pets with thick or heavy coats (e.g. Huskies and other “Northern Breeds”), as well as pets with pre-existing heart, breathing (e.g. collapsing trachea, laryngeal paralysis, etc. ), and other medical conditions (e.g. Addison’s disease, especially). What's "comfortable"? If the pet looks relaxed, is responsive (e.g. comes to see you at the window, wags its tail, etc. ), and otherwise looks at ease and isn't panting heavily you probably have a bit of time to find the owner, without compromising the health of the pet or damaging the vehicle. Wait by the vehicle for 5 minutes to keep a close eye on the pet(s) and the situation. Follow the steps in Step 1. Be sure to specifically note the time you first came upon the vehicle and the time you spent there — use the “stopwatch” function on your smartphone or watch or take a screenshot of your phone's screen. If you are unable to wait by the car, please still help by recruiting additional helpers and witnesses to do so. We understand that not everybody has the time to wait, and that not everybody has the time or desire to get involved in a potential altercation or legal battle. Taking the first step of raising the alarm bells and recruiting others is actually a huge help! After 5 minutes, if the owner hasn’t returned to their vehicle, reevaluate and document the situation, recruit additional helpers and witnesses, and proceed to try and find the owner. Call or visit the central security department if you are in the parking lot or garage of a mall, movie theater, amusement park, etc. Alert them to the problem and enlist their assistance. Go to the surrounding businesses and ask them to make a “life-saving announcement” over their public address system. Go armed with pictures/video of the vehicle (showing license plate, make, model, color, location) and the entrapped pet. It’s often best to ask at the Customer Service desk, or ask a manager of the store. If there is resistance, be persistent and impress upon them the gravity of the situation. REI in Portland did an amazing job! Upload pictures of the vehicle and the entrapped pets to your Facebook page and/or Twitter feed (as this concerned citizen did) — tag the location and highlight that this is an emergency. Ask people to share the images to help find the pet’s owner. Ask that if someone knows the owner of the vehicle they should immediately call that person to let them know of the grave situation their pets are in and that they need to return to their vehicle to prevent further suffering or tragedy. How to assess "uncomfortable": Are they panting, looking anxious, seeking out shade within the car? Are there saliva, nose and/or paw smudges on the window? Click to see a video of what this "looks" like. How to assess "uncomfortable": Are they panting, looking anxious, seeking out shade within the car? Are there saliva, nose and/or paw smudges on the window? See a video of what this "looks" like. 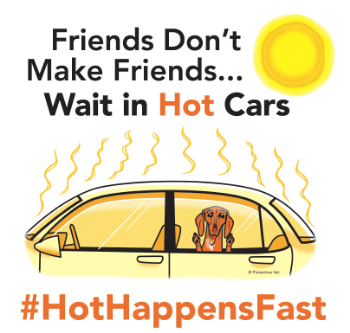 Help the pet in the car while waiting for the owner to be located or emergency services to arrive. Offer cool water from a squeeze bottle through any crack in the window(s). Don’t let it flow too fast and don’t force it on the pet — you don’t want it to go down their wind pipe and into their lungs, which would further worsen their ability to cool themselves off. Use cardboard, a windshield sunshade, a towel, blanket or anything else you can find to block the direct sunlight where it is hitting the windshield or windows of the vehicle. This can help slow the rate of additional heat rise within the vehicle. Call 911 (here's a list of emergency services numbers in all countries). Call the local TV news outlets and ask them to come down to cover the situation. 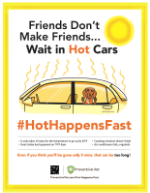 Not only will this help to document the case for any possible legal actions, but it can also help to spread important awareness amongst the general public about the dangers of leaving pets in hot cars, as well as providing a role model to encourage others to take action in similar situations. Recruit additional helpers and witnesses, and document everything as per Step 1. How to assess "distress and immediate danger": Are they appearing dazed/confused/uncoordinated, or unresponsive? Have they vomited or had diarrhea in the vehicle? Do you notice any bleeding, such as from their nose? Is their tongue or gums a bright red or purplish color? Remember, the PRIMARY goal is an outcome that results in the improved comfort and safety of the entrapped pet(s). If you can also help to build a legal case against the people who put the pet(s) in this dangerous situation in the first place, that is an added bonus. Especially if you can do so without landing yourself in hot water with the law, too! Do Step 1 as best as you can. Document everything and ensure you have additional helpers and witnesses. PLEASE BE AWARE that breaking into someone else's vehicle, even if to save a pet's life, is currently illegal in many states. Click here to check the laws in your state and then proceed with the following steps at your own risk. Check the door, if it’s unlocked it’s far easier (and safer) than breaking a window. See if you (or someone else) can reach through the window to unlock the door — just be VERY careful not to get bitten! Some dogs can be very protective of their space and their owner’s property — and a distressed dog may be even more so. If you determine that the situation requires breaking a window, and there are no legally-authorized first responders around to do so, then ensure that you have taken the steps (in Step 1) to document the situation and protect yourself, and then do what you need to save the pet’s life. If you decide to break a window, be sure to choose the window furthest away from where the pet is within the vehicle. Have a leash, towel, or something else at the ready to prevent the released pet from bolting out of the vehicle, where they might get struck by a passing car or run off! This is perhaps even more likely to happen if your means of gaining entry to the car were to set off the car’s alarm system, as the noise may very likely startle and scare the already distressed pet. If you haven't already found the pet's owner, their tag or collar may provide information on how to locate them. Some pets who have pet insurance tags can be located by calling the pet insurance company listed on their tag. PLEASE BE AWARE that breaking into someone else's vehicle, even if to save a pet's life, is currently illegal in many states. Check the laws in your state and then proceed with the following steps at your own risk. If the pet is collapsed or unresponsive, if there is any evidence that they have vomited or had diarrhea as a result of the heat, if there are any bruises on them or bleeding from their nose, mouth, or anywhere else, or if you don’t have ready access to cool water or shade, please bring the pet immediately to the nearest open veterinary facility. The delay caused by attempting to administer first aid in these scenarios will likely decrease the chances of a favorable outcome for the pet. Proper and rapid veterinary care is the pet’s best chance. Important note: If the pet is collapsed or unresponsive, if there is any evidence that they have vomited or had diarrhea as a result of the heat, if there are any bruises on them or bleeding from their nose, mouth, or anywhere else, or if you don’t have ready access to cool water or shade, please bring the pet immediately to the nearest open veterinary facility. The delay caused by attempting to administer first aid in these scenarios will likely decrease the chances of a favorable outcome for the pet. Proper and rapid veterinary care is the pet’s best chance. Immediately move the pet to an area protected by shade. Don’t lay the pet directly on asphalt or the sidewalk — these surfaces can be hot enough to cause burns. If there’s no grass or dirt to lay the pet on for first aid, lay down a towel, blanket, coat, cardboard, or something else to put the pet on and protect them. If they are alert and able to safely drink water, offer them small amounts of cool water frequently. Don’t give them too much at once, as doing so may cause vomitting and make matters worse. NEVER force water into the mouth of a pet that isn’t able or willing to drink it on their own. If you have a digital thermometer handy and you can do so safely, get the pet’s rectal temperature. Here's how it's done. Pour cool water from water bottles or a hose over the pet — do NOT use ice or immerse the pet in cold water. Drape wet towels or a wet sheet over the pet to help with evaporative cooling. Either keep the towels/sheet wet by refreshing them with cool water from a water bottle or hose, or replace the towels/sheet with freshly wet ones as they dry. Once the pet is cooled to 103.5 F (40 C), transport them (ideally in a pre-cooled car) to the nearest open veterinary care facility for evaluation and continued care. If possible and practical to do so, phone the veterinary center while on your way there to allow them to best prepare for your arrival. Somebody should leave a note for the pet owner to let them know where their pet was taken. Ideally the authorities (and the local news outlets) have arrived by now, and ideally they can be the ones to wait around for the pet owner, too! Do NOT skip the trip to the vet, even if the pet seems fine. Internal damage or other issues may have arisen that aren't noticeable to untrained professionals. That’s it! You’ve helped save a life, and you’ve helped to raise awareness too. Thank you!